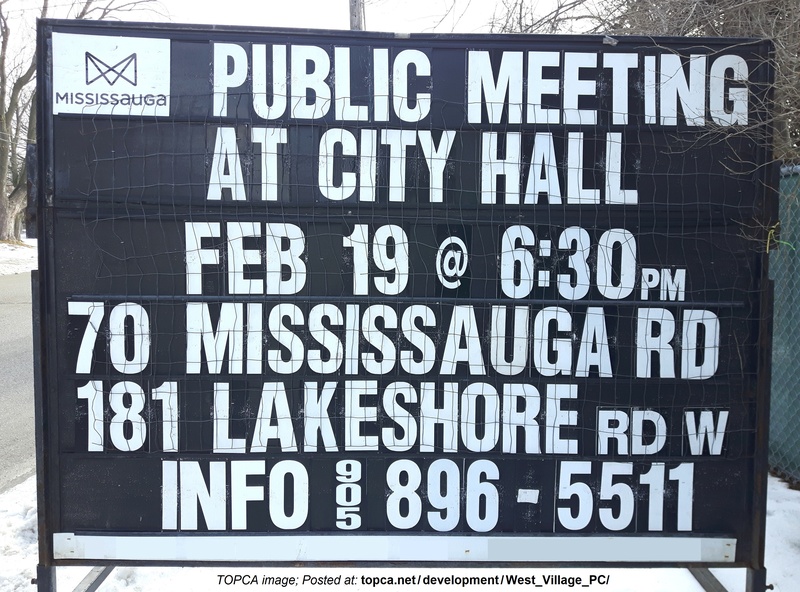 PUBLIC MEETING - STATUS UPDATE: Tuesday, February 19, 2019 @ 6:30 pm at City Hall (Council Chamber). 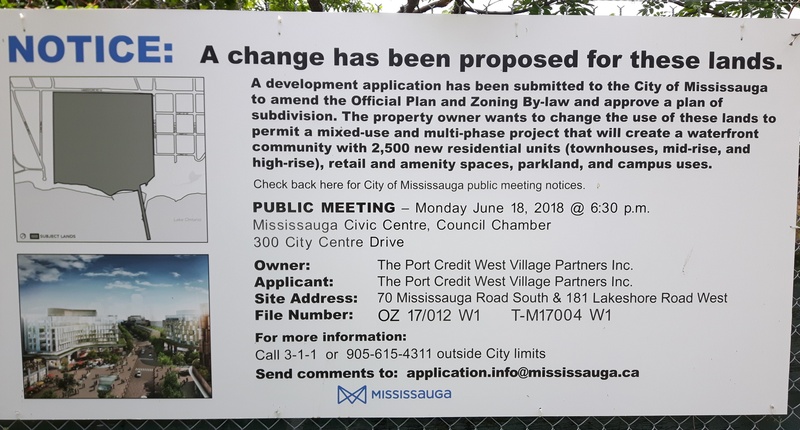 At this public meeting of the Planning and Development Committee (PDC) which includes the Mayor and Council, the Planning and Building staff will present a Status Update Report on the review of the West Village Partners development applications, which were revised in November 2018. Key outstanding issues will be identified. People will be able to ask questions and share their views about the proposal. NOTE: The PDC will not make a decision about this project at this meeting. ► Can't attend? The meeting will be live-streamed (and later archived) here. 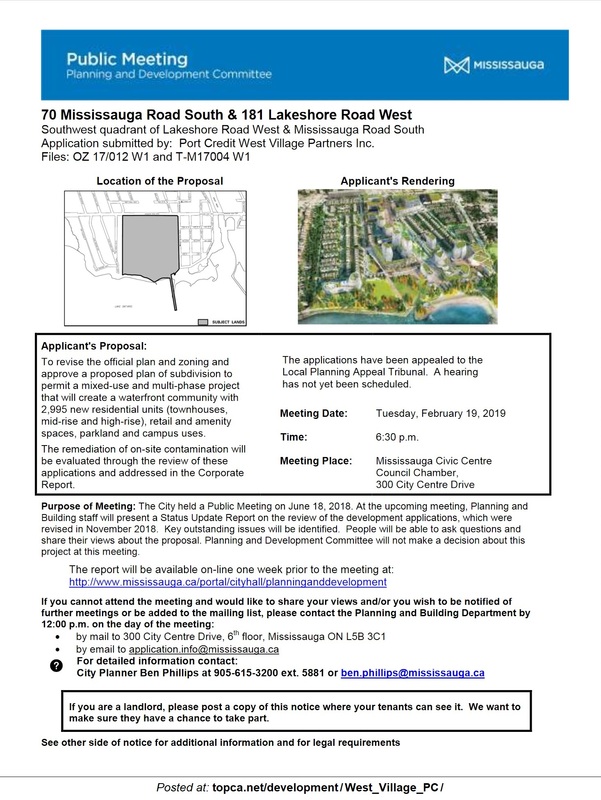 ► The Planning Staff Report is posted in the PDC Agenda (Item 4.2) for February 19, 2019 @ 6:30 pm (direct link), which starts on page 47 (to p55) of the PDF. 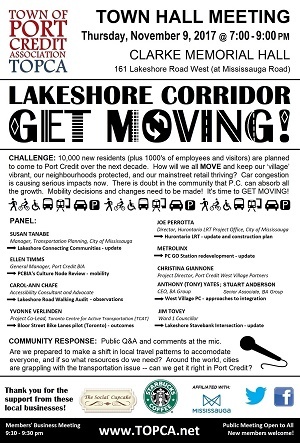 ► NOTE: The City has issued a Notice of Public Meeting (2p PDF). Image of the 1st page of the Notice is posted in the sidebar -- click to enlarge. ► View the City's Planning and Building Dept. 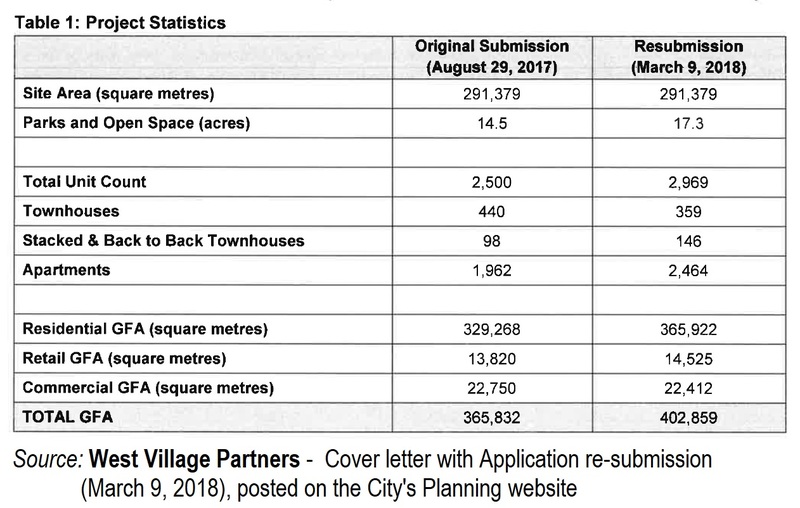 Port Credit West Village webpage which provides access to all the WVP submissions made as part of the original application and most recent (November 2, 2018) resubmissions. 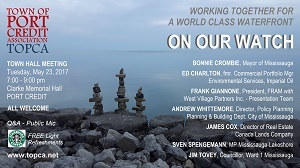 ► View Port Credit West Village Partners website. ► APPEAL: West Village Partners filed an appeal with the Local Planning Appeal Tribunal (LPAT). TOPCA was represented at the pre-hearing conference on November 23, 2018 to request standing as a Participant at the formal Hearing. The Decision (5p PDF) was issued on January 21, 2019, confirming that TOPCA (via members and officers) will be a Participant in the ongoing process. 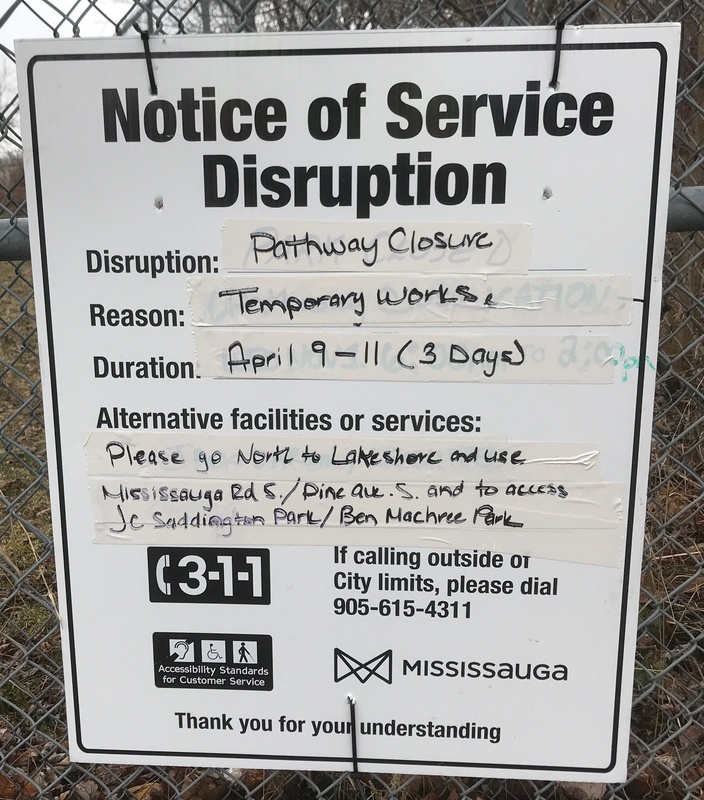 SIGN POSTED ON FENCE OF THE PROPERTY: Note unit count is now 2995. PUBLIC MEETING: Monday, June 18, 2018 @ 6:30 pm at City Hall (Council Chamber). This statutory public meeting of the Planning and Development Committee (all of Council) will address the West Village Port Credit development proposal and welcomes public comment. 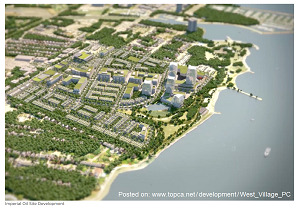 ► View the TOPCA Deputation: Top 10 Issues re: West Village Port Credit (4p PDF). ► The Planning Staff Information Report which will form the basis of the meeting (it records all public and other agency comments received to date) is posted in the PDC Agenda (Item 4.5) for June 18, 2018 (direct link), which starts on page 171 of the PDF. ► NOTE: The City has issued a Notice of Public Meeting (2p PDF) to Residents about this Information Meeting on June 18, 2018. City staff will be listening to public comments and recording them for a Supplementary Report. 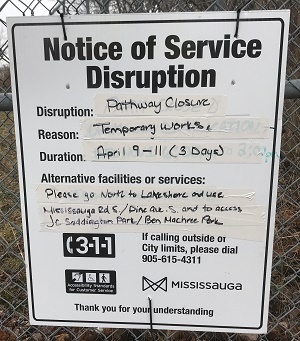 SIGN POSTED ON FENCE OF THE PROPERTY: Unit count should now be 2969. TOWN HALL MEETING: Monday, March 26, 2018 @ 7:00 - 9:00 pm at Clarke Hall. 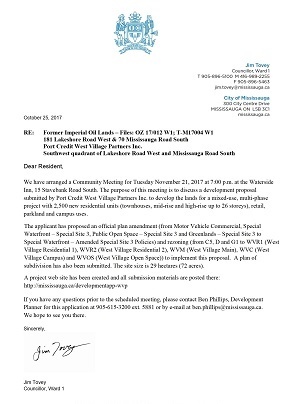 This public meeting will address changes to the West Village Port Credit development proposal, prompted by the Planning Dept’s comments after the Community Meeting held at the Waterside Inn on November 21, 2017 (see Councillor's Letter in sidebar). 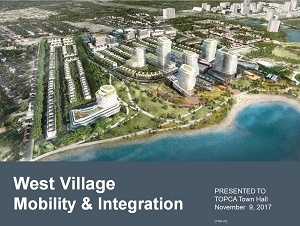 Planning Staff will be on hand for public questions, after a presentation by West Village Partners. Included in the presentation by West Village Partners will be an environmental update about the significant remediation work taking place on the site (per photo below, Winter 2017). ► NOTE: The City has issued a Notice to Residents (2p PDF; with AGENDA) about this Community Meeting on March 26, 2018. City staff will be listening to public comments. APPLICATION RE-SUBMITTED: March 9, 2018 - Port Credit West Village Partners re-filed their application in response to comments received from the City Planning Dept., after the Community Meeting held at the Waterside Inn on November 21, 2017 (see Councillor's Letter in sidebar). 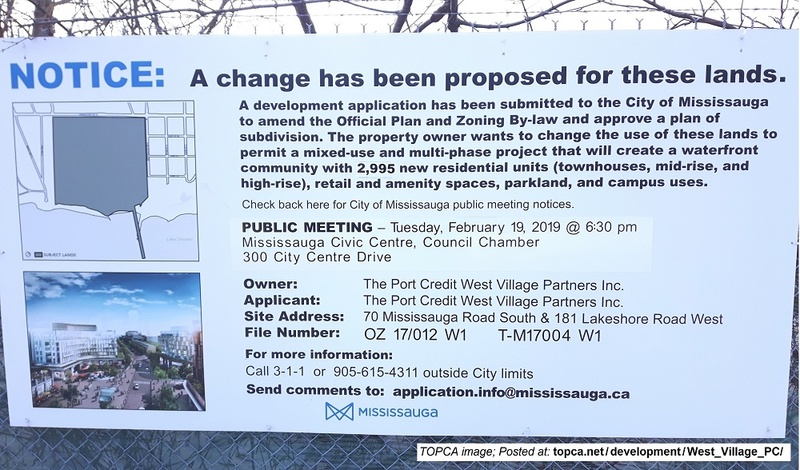 The re-submission is posted on the City's Port Credit West Village webpage. Click image to view TABLE in the WVP Cover Letter, posted on the City's website, summarizing changes from the original submission. 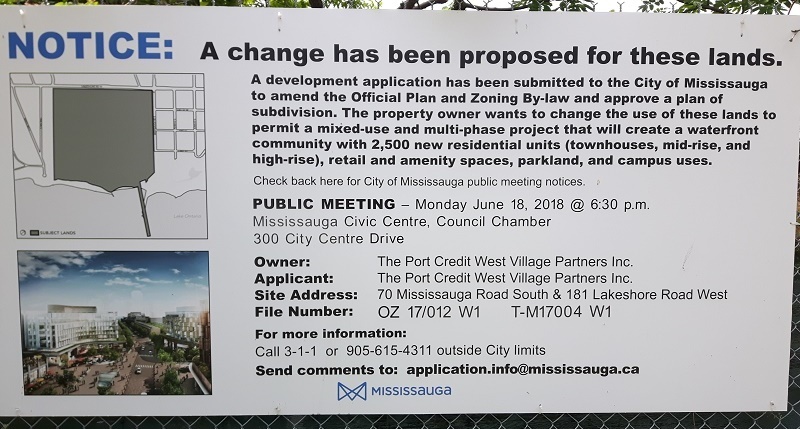 APPLICATION SUBMITTED: August 29, 2017 - Port Credit West Village Partners filed their application for an Official Plan Amendment, Zoning By-Law Amendment and Draft Plan of Subdivision with the City of Mississauga. ► View the PUBLIC NOTICE (2p PDF). NOTE: This site was included on the TOPCA Heritage Bike Ride (October 1, 2017). ► View the City's Planning and Building Dept. 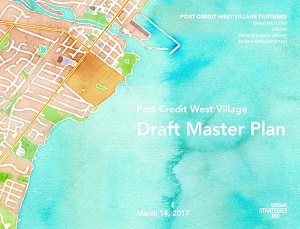 Port Credit West Village webpage which provides access to all the WVP submissions made as part of the application. 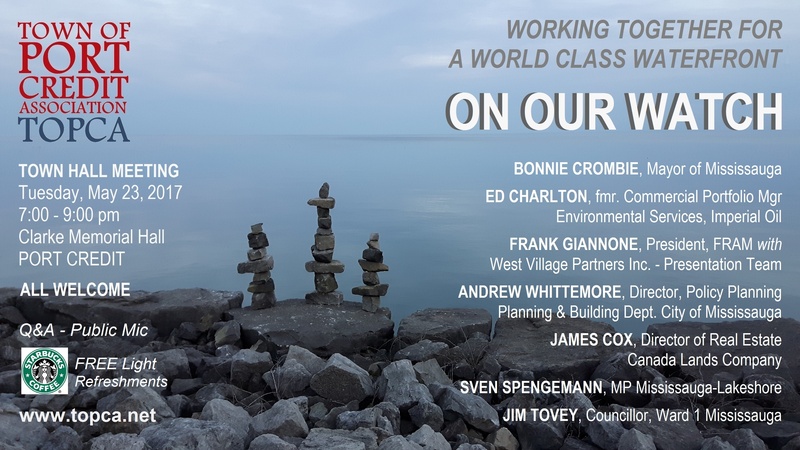 ► View West Village Partners Port Credit website (source of 2017 image below; click to zoom). CASE STUDY: The West Village Port Credit mixed-use development proposed for the 72-acre brownfield in the midst of our waterfront village will be transformative. Successful integration with the surrounding community will require bold innovations – both on and off-site – in support of mobility. 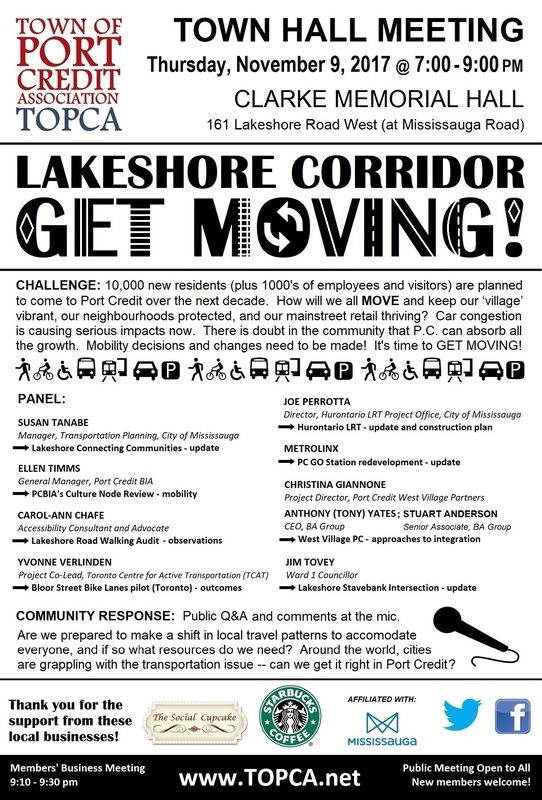 What is proposed to enable 5000 new residents, along with 1000’s of daytime employees, shoppers, and park visitors to move along an already gridlocked Lakeshore Corridor? 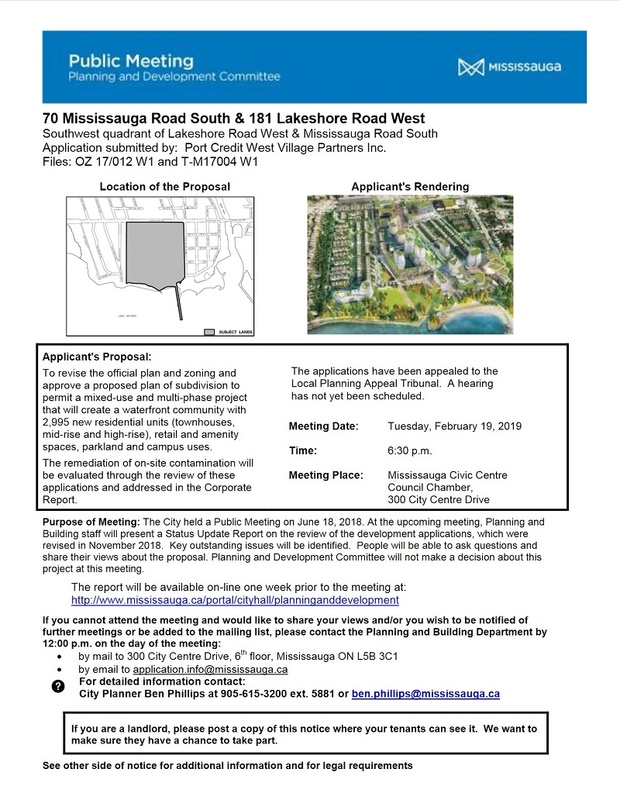 WEST VILLAGE PC PROPOSAL - PUBLIC MEETING: The Draft Master Plan for West Village Port Credit (125p PDF) submitted by West Village Partners, is at the City's Planning & Development Committee (PDC) on June 26, 2017 at Mississauga City Hall in the Council Chamber. 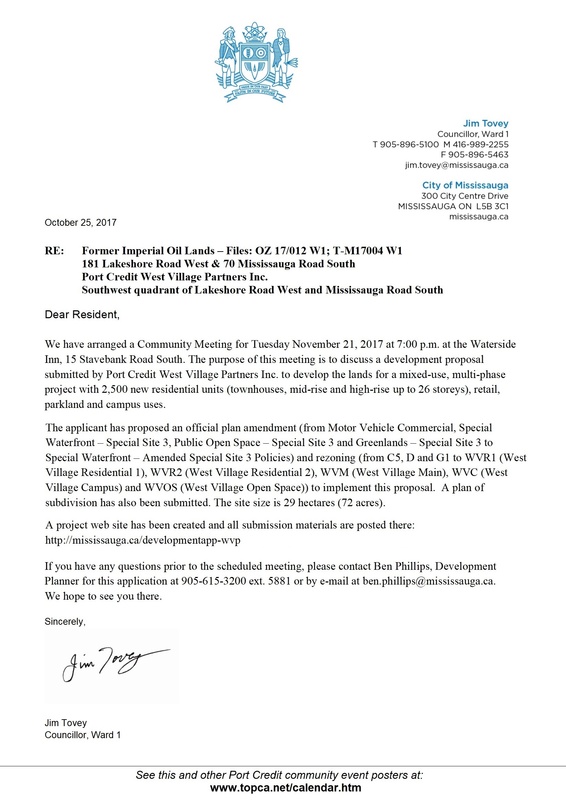 The public is invited to make comments at the meeting after the presentations by WVP, and Planning Staff. FREE underground parking at the Mississauga Civic Centre (map). ► Watch the live stream VIDEO if you can't attend the meeting in person. ► View the PDC June 26, 2017 Agenda (item 4.7). 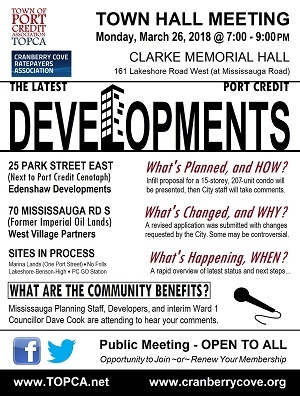 Pages 158-174 of the PDF is the Planning Staff Information Report including oral and written public comments received at the Community Meeting in Port Credit on June 8, 2017. 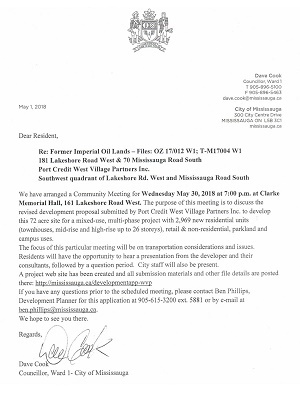 ► TOPCA will be making a DEPUTATION at PDC on June 26, based on the questions and concerns raised at the TOPCA Waterfront Town Hall meeting (May 23, 2017), and the June 8 community meeting (per below). The TOPCA Deputation will be posted here afterwards. 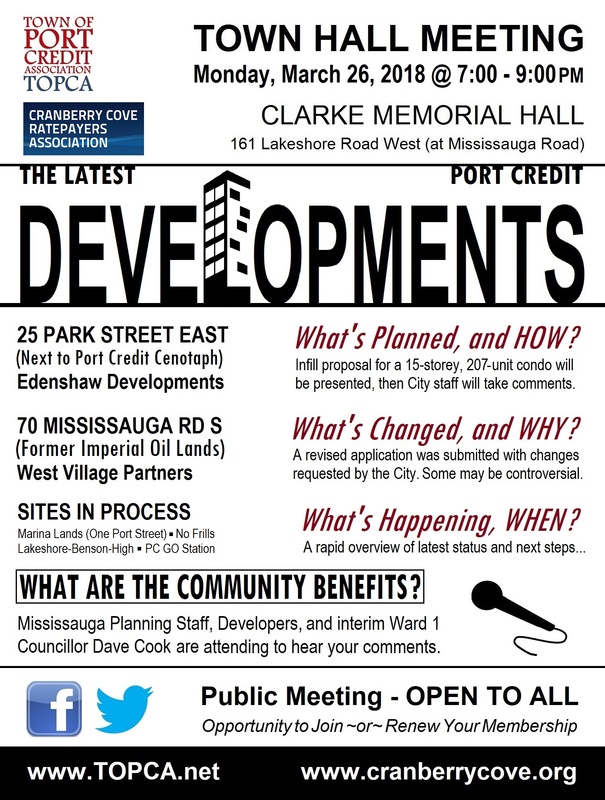 ► View the Inspiration Port Credit home webpage for more information about the PDC meeting, and IPC background. 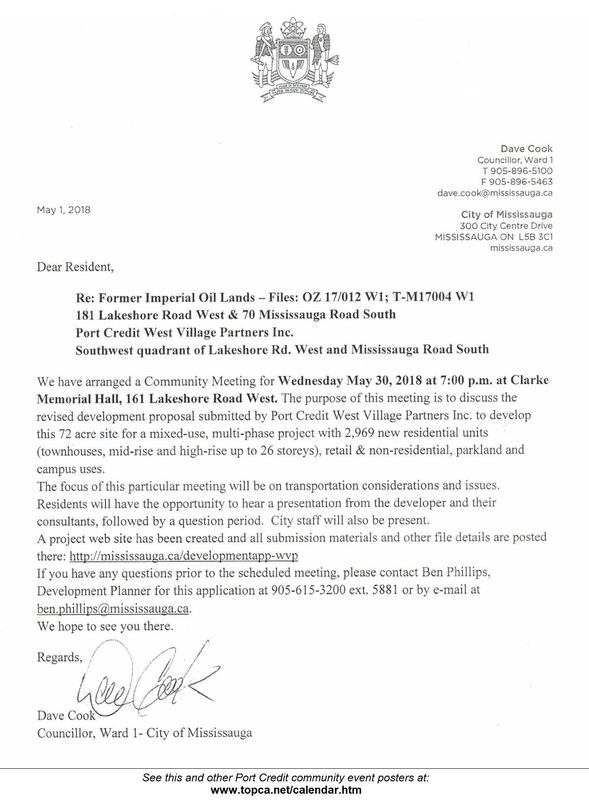 INSPIRATION PORT CREDIT: The City is holding a Community Meeting on June 8, 2017 at Clarke Hall @ 6:30 - 9:00 pm re: the West Village Port Credit Draft Plan for the former Imperial Oil brownfield lands. ► See the Inspiration Port Credit website for background and details. 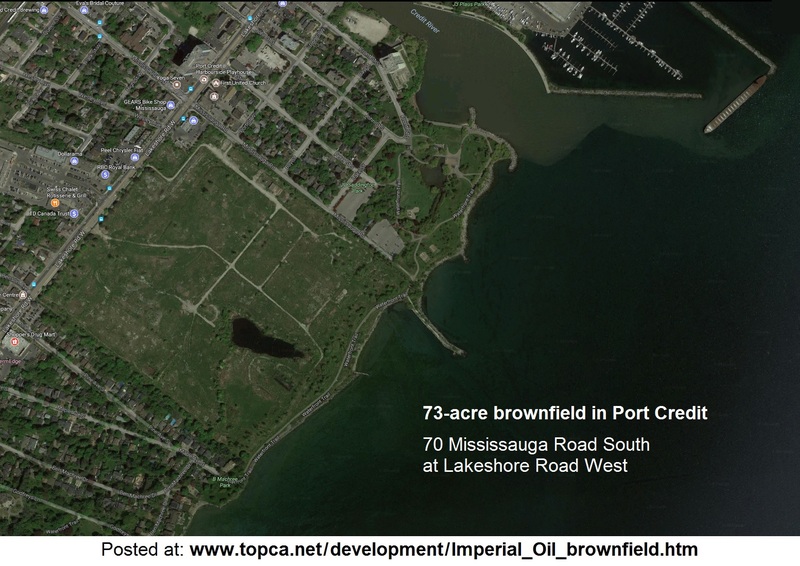 ON OUR WATCH: TOPCA is holding a Waterfront Town Hall Meeting on Tuesday, May 23, 2017 at Clarke Hall @ 7:00 - 9:00 pm re: The Port Credit Marina Lands and the West Village Port Credit Draft Plan for the former Imperial Oil brownfield lands. ALL WELCOME! 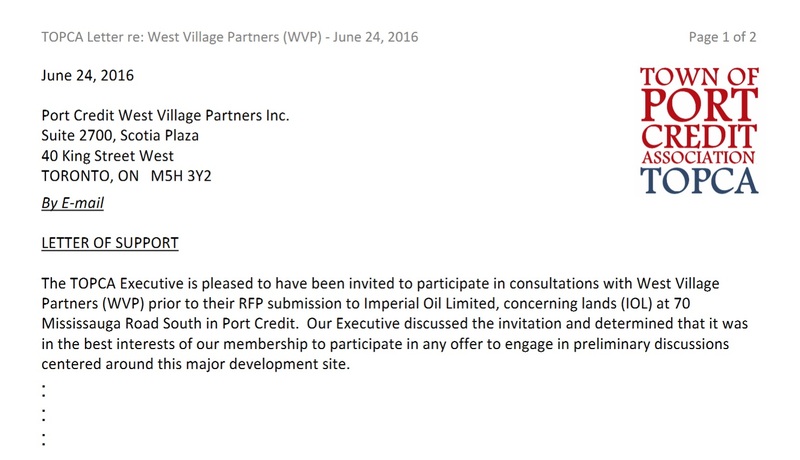 ► View WVP Agenda for May 23 presentation. ► Below: Aerial concept image provided by WVP, April 2017. Enlarge. 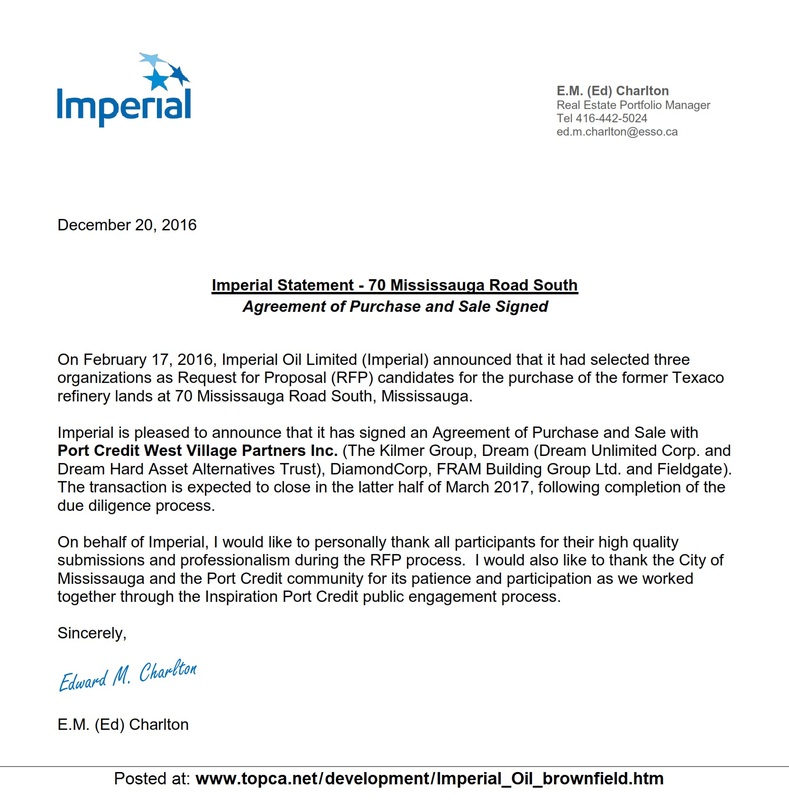 This brownfield site has been a major focus of the Inspiration Port Credit public consultation, and the resultant framework document 'Charting the Future Course' (Nov. 2015; 78p PDF) was included in the Imperial Oil RFP process. 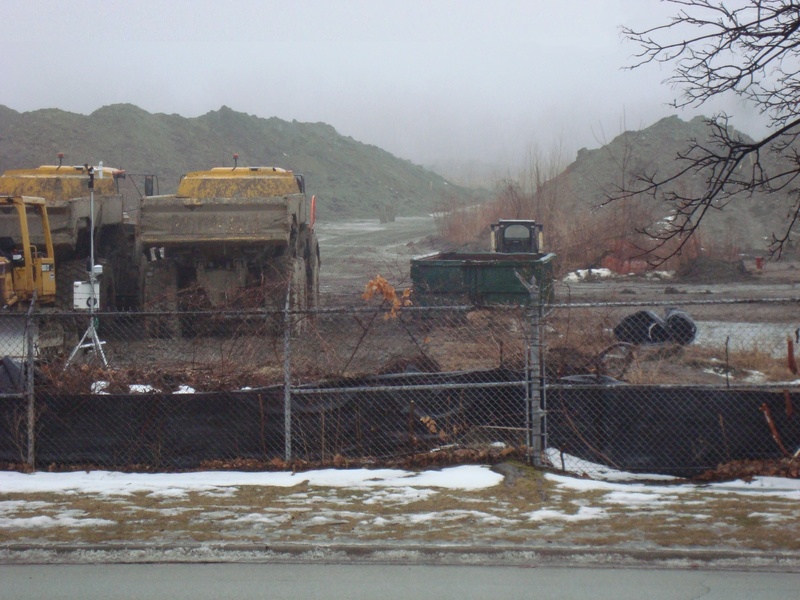 E-mail your comments to the City Planner of Record, Ben Phillips, and copy Ward 1 Councillor Stephen Dasko. Please consider copying the TOPCA Executive so that we can best represent the community's views when taking any formal position. 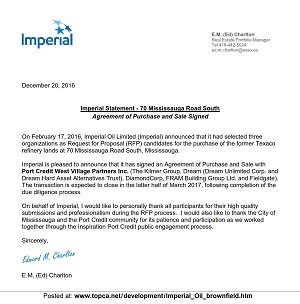 ► TOPCA's Imperial Oil Brownfield webpage contains chronology of this site before sale to West Village Partners Inc. in December 2016.